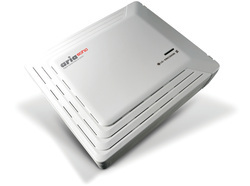 ARIA SOHO is designed to be a user manageable telephone system in regard to installation and O&M. With Plug & Play facility thru a full-hybrid architecture, the ARIA SOHO gives a maximum flexibility in selecting types of user terminals whether dealing with Analog SLT, FAX or Digital phone. And when connecting external lines, ARIA SOHO recognizes varying signals identifying FAX from voice and automatically delivering them to the appropriate types of terminals. In fact, this facility can especially satisfy the needs of small- to medium-sized enterprises as well as home users with little-to-no engineering background. Traditionally in the small telephony environment, fundamentals in technology seem to be beyond the interest of users as long as basic services are satisfied. This nature often keeps users from evolving to an upgraded environment for smarter communications and also forces them to resort to a separate payment for additional services. As one of basic components, LG-Ericsson has developed an integrated device and implemented it into a basic cabinet of ARIA SOHO making some of services costless. Due to its digital architecture, ARIA SOHO easily and affordably expands up to 48 extensions without wasting initial investment. As cost can be a primary issue for most small offices, digital telephones could be selectively given to only a few employees. Accordingly, the majority of system features should be easily supported to SLT users rather than digital proprietary telephones users. In ARIA SOHO, the upgraded services represented by SMS, CID and several PC applications are analog extension focused. ARIA SOHO provides services to monitor and restrict outgoing traffic (as needed) in order for a manager to control communication cost. On users’ requests, ARIA SOHO can provide additional sophisticated options usually offered in larger telephone systems. Small enterprises or home users may want to have full-control to manage the system for themselves. ARIA SOHO gives hands-on methods for M&O like PC-Admin (On-line / Off-line) software and Speed Editor for updating the User database.